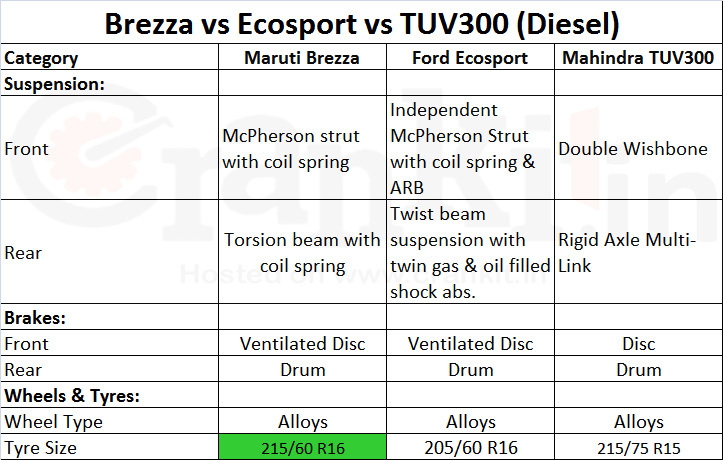 Brezza vs Ecosport vs TUV300 are competing in the sub-4 meter SUV segment which is gaining huge popularity in India. Vitara Brezza is Maruti’s first entrant in this segment. Can Maruti Brezza take on India’s largest selling sub-4 meter SUV Ford Ecosport? We have compared the three cars on 51 points to find out if Brezza can create a challenge...! All the three cars have a turbo-charged CRDi engine which is the BS-IV complaint. 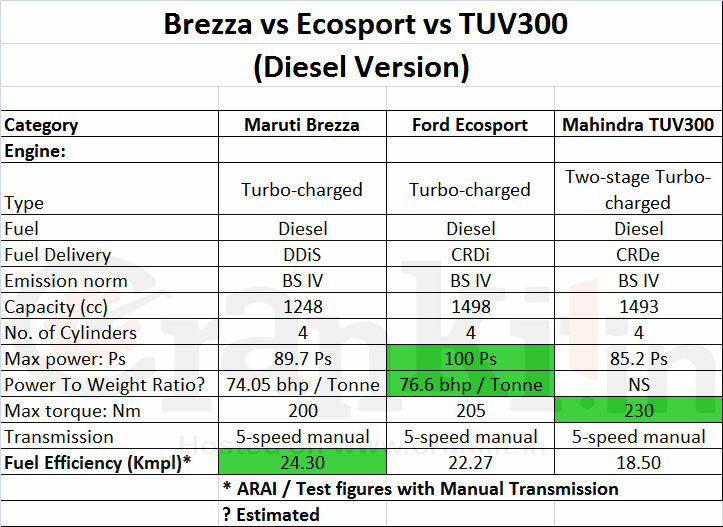 Brezza’s 1.3L DDiS engine produces a decent 89.7 Ps & 200 Nm torque which is marginally higher than Mahindra TUV300 producing 85.2 Ps and 230 Nm respectively. However, with 100 Ps & 205 Nm, the Ford Ecosport is the most powerful among them. Ecosport also has better power to weight ratio because of its lightweight structure; while the heavier TUV 300 appears to be a bit under-powered among the three. However, TUV 300 has the highest torque among the three. All the three cars are almost the same in length i.e. under-4 meters. TUV300 has a wheelbase of 2680mm - the highest among all, making it spacious internally. The 1839mm height of TUV300 makes it easier for ingress & egress. Ford Ecosport has the highest ground clearance of 200 mm, which suits the Indian road conditions. All three cars have foldable rear seats making more room in the boot to carry excess luggage. Both Brezza & TUV300 provide normal power steering, while the Ecosport is equipped with electric power steering (EPS). However, with the lowest turning radius of 5.2 meters, the Brezza will be able to turn easily in the narrow lanes. The front suspension of the Brezza & Ecosport includes McPherson Struts - just like cars, whereas the TUV 300 provides an SUV-like double wishbone suspension. The rear suspension for the Brezza & Ecosport has a Twist-Beam design with coil spring and an anti-roll bar; whereas that on TUV300 is a rigid axle with multi-link. All the three cars provide disc brakes at front and drum brakes at rear and also the alloy wheels. Brezza has a tire size of 215/60 R16, a 16” radial that is slightly wider than Ecosport & TUV300 which is an advantage on Indian roads. All three cars provide the key safety features as standard; which are - ABS with EBD, driver & passenger airbags, engine immobilizer, keyless entry, and central locking. Among the three, Ecosport and Brezza provide more features such as push-button start, rain sensing wipers, automatic a/c, electric tailgate release and automatic headlamps. In addition, the Ecosport also provides side & curtain airbags, two-tone upholstery, and front & rear fog lamps which improve visibility. Brezza is the only vehicle that provides touch-screen & navigation with voice command, whereas Ecosport is equipped with voice command only. The TUV's screen can be controlled thru' an app. The driver seat on Ecosport & TUV provides adjustable lumbar support too. 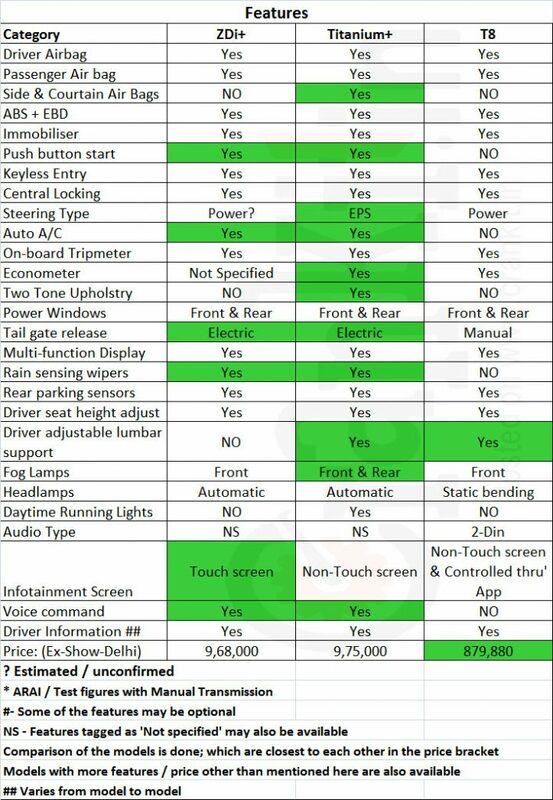 So, in general, Ecosport leads the features list. Brezza’s 48-liter fuel tank is smaller as compared to 60 liters of TUV300. Ecosport takes a mid-way with 52 liters. However, Maruti Brezza scores the goal where it matters the most to Indian consumers. Brezza delivers best-in-class ARAI mileage of 24.30 Km/L as claimed by Maruti, and tops the list. Ford Ecosport gives 22.27 Km/L while TUV300 lags behind with 18.50 Km/L. All the three cars provide a 5-speed manual transmission, whereas TUV300 comes with an optional AMT at a higher price; certainly an advantage. Brezza’s ARAI certified fuel average of 24.30 Km/L makes it a star in this category. The fully loaded top end ZDi variant of the Brezza is reasonably priced at Rs. 9,68,000/-(ex-show Delhi). Ecosport which comes with a price tag of Rs. 9,75,000 has more value for money. The battle of the sub-4 meter SUVs is not an easy one as Ecosport has established itself over the time and continues to dominate the segment with its performance & features. Brezza with 24.30 Km/L looks promising but TUV 300 will have to fight really hard to make the sell numbers.